Incentives on the slow-selling Fiat 500L should be plentiful. The 2019 Fiat 500L is a tall-riding family hatchback that struggles with style and comfort in the name of affordability. Sometimes affordable transportation is just that. What verve the 2019 Fiat 500L had when it was new has withered and the five-door hatchback that’s left is a family hauler with a bright interior and practical shape. This year the 500L stands pat after a redesign last year. 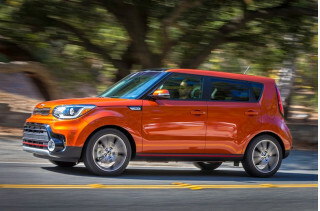 It’s available in Pop, Trekking, and Lounge trims, all powered by a 1.6-liter turbo-4 mated to a 6-speed automatic that power the front wheels only. It’s not fast, but the ride quality is relatively good. The 500L seats four adults, but front-seat accommodations are a little thin. An awkward driving position affords good outward vision, but lacks all-day comfort. Behind the second row, the 500L offers more than 22 cubic feet of space, which is useful. All Fiat 500Ls are equipped with a 7.0-inch touchscreen for infotainment, Bluetooth connectivity, power features, and a USB charger. Top trims get leather upholstery, but no amount of money can purchase active safety features such as automatic emergency braking or active lane control. The Fiat 500L is best near base, where its low price and high versatility outshine relatively cramped quarters. Better after a redesign last year, the 2019 Fiat 500L is still an upright wagon. A year removed from a slight update, the 2019 Fiat 500L could use more time. Starting from its blunt nose, the 500L takes risks in its irregular roofline that we’re not sure pay off. The big glass and tall shape pay dividends on the inside, but perhaps not much on the outside. The front and rear bumpers were reshaped last year to be a little more straightforward than before—an Italian car without much expression, perhaps. Inside, the story is better with big round knobs and a 7.0-inch touchscreen that dominate attention. Some trim levels add contrasting roof colors or interior materials that zing, new colors in the Fiat palette can somewhat help. 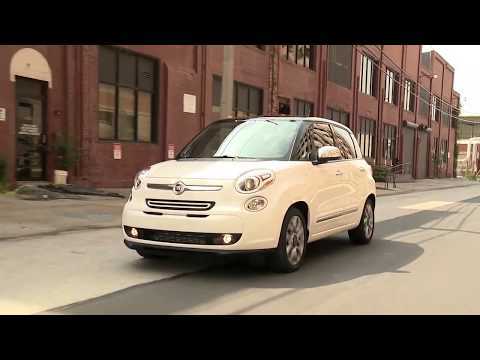 Tasked with too much weight to move, the Fiat 500L’s powertrain quickly runs out of breath. Time has passed by the 2019 Fiat 500L—many other cars have, too. The Fiat family hauler is slow and lacks all-wheel drive that the 500X across the showroom offers. The Fiat 500L is powered by an overwhelmed, 160-horsepower 1.4-liter turbo-4 tasked with moving nearly 3,200 pounds. The busy turbo-4 doesn’t return spectacular mileage, 25 mpg combined, and requires premium fuel. In our experience, the 500L’s turbo is somewhat reassuring around town but quickly runs out of ideas on the highway and requires planning to pull of passes. There’s just too much mass to lug. 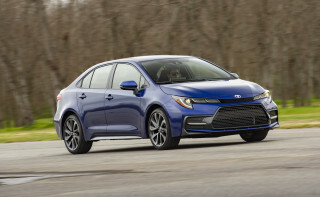 The bright side is lively steering and a smothering suspension that helps tame road. The 500L uses a low-cost twist beam in the rear, but with Koni shocks that absorb some of the jittering rear end. It’s comfortable, but not convincingly sporty. Hatchback versatility isn’t lost on the 2019 500L, but front-seat passenger comfort is. 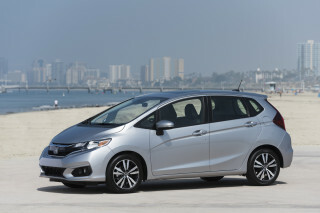 Hatchbacks are versatile family cars with plenty of room for people and cargo. The 2019 Fiat 500L hatchback fits the bill, but perhaps not as comfortably as others. Fiat has mostly let the 500L wither since it went on sale five years ago. A mild update last year brought a new steering wheel, among other changes. The new grip hasn’t changed the school-bus feeling we’ve had behind the wheel, with an upright seating position but excellent outward vision. The seat bottoms are unusually flat and lack support, but the high roofline should give taller drivers excellent head room. The rear seats are perched somewhat higher than the front seats, and offer adequate leg room—40 inches to be exact. Three adults will struggle to fit in the back, two should have plenty of room. The rear seats slide nearly 5 inches fore and aft, and oddly recline too. That’s mildly helpful for passenger comfort, but more useful for cargo flexibility. With two rows of seats in place, the Fiat 500L holds 22.4 cubic feet of cargo, which is only average. With the second row folded, the space opens up to 68 cubic feet, which is as much as some larger SUVs. The rest of the cabin isn’t as friendly to storing items. The 500L lacks some small storage space, and a shallow tray splits the two small glove boxes into less-than-useful cubbies. Crash-test data for the 2019 Fiat 500L isn’t yet complete. Safety scores for the 2019 Fiat 500L aren’t yet complete, and considering the car’s age and low sales we don’t expect that to change soon. 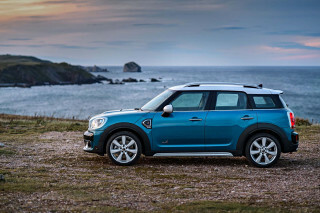 Only the insurance industry-funded IIHS has rated the 500L and they weren’t complimentary. 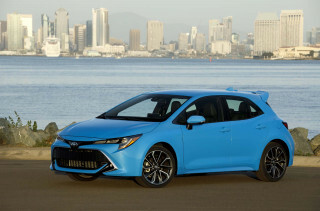 The hatchback scored a “Poor” rating for driver’s side small-overlap crash protection, and the passenger side hasn’t been rated at all. The 500L critically lacks forward-collision warnings with automatic emergency braking, active lane control, or adaptive cruise control. Only parking sensors are available on top trims. 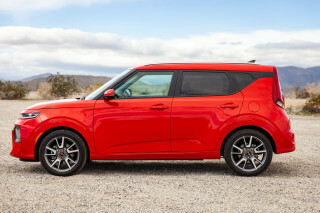 Federally mandated features such as airbags, traction control systems, and a rearview camera are standard on all trim levels. The 500L is exceptionally easy to see out of, which is a relative advantage for the small car that lacks active safety features. Base versions of the 2019 500L are the best deal, and incentives should be plentiful. The 2019 Fiat 500L lineup is down to three trim levels this year: Pop, Trekking, and Lounge, with similar equipment among the three. Leather upholstery, dual-zone climate control, and a native navigation system largely separate the base Fiat 500L that costs around $22,000 from the fully loaded version that costs about $25,000. None of the 500L trim levels offer automatic emergency braking, no matter how much money you throw at it. 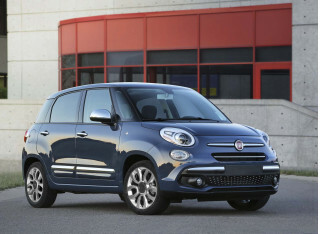 The Fiat 500L Pop is the base trim and it offers cloth seats, 16-inch wheels, one USB charger, power features, Bluetooth connectivity, and a 7.0-inch touchscreen for infotainment. It’s where we suggest 500L shoppers begin and end—spending more doesn’t necessarily get more. The Lounge version is the relative pinnacle of the 500L and features leather upholstery, navigation, premium audio from Beats, heated front seats, power lumbar adjustment, 17-inch wheels, parking sensors, and dual-zone automatic climate control. 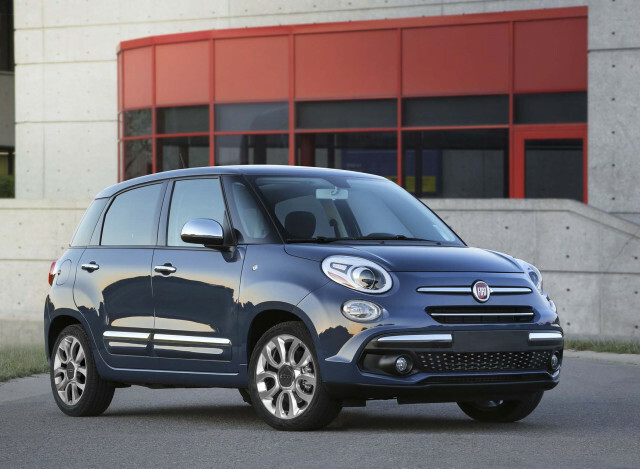 The Fiat 500L is aged compared to newer family cars—even compared to the 500X sitting across the lot. 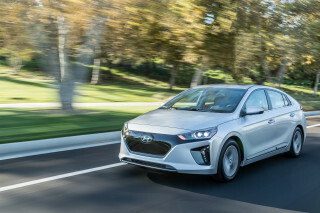 Deals and incentives on a new model should be plentiful. Fuel economy isn’t the first reason to consider a Fiat 500L. The 2019 Fiat 500L offers a simple powertrain menu—just one transmission, and one engine—with average fuel economy returns. The bad news? It’ll take the pricier, premium stuff to get there. Among family-sized hatchbacks, the 500L is falling behind. The hybrid Kia Niro is rated at 50 mpg combined and the Mini Cooper Countryman rates up to 28 mpg combined.